June Incentive Winners, Dot Dollar Days, & Count down to Hoopla! So how are you working your business around your vacation schedules this summer? Let me know if you want to talk one-on-one about how you can have it all... time with your family & keeping your business active at a pace that works with these lazy summer days. In a bit, I will share a few tips on how I am managing it this month, keeping my eye on my goal of earning heart of leadership this month for our team but first... I need to recognize a few teammates for all their hard work in June! Congratulations to 4 ladies who met my June challenge to sell $1000 or more, and not only earned their $100 "stack up your rewards" free product credits, and their $100 consistency bonus, but will be receiving a piece from the new collection from me!! And at month end, I issued a little challenge to a few ladies to push for that $500 in sales so as to not leave that $100 consistency bonus on the table and earn those free business supply credits to spend on the new look books to boot! These ladies are also going to be getting a new piece from the collection for their efforts! Congrats to Meg Fontecchio & Chiara Rhouate! I also want to congratulate Holly for bringing on a new team member in June! Welcome to Jackie Glasscock who joins us from Tyler TX! Congratulations Jackie on kicking off your own Stella & Dot business. Holly has raved about you, and I know you are going to do fabulously! And you couldn't have a better mentor than Holly! Welcome! Okay, now here we are in July with summer in full swing. How do we keep our businesses going during these lazy summer days when we want to slow things down and enjoy the summer months with our families? This is going to be my fourth summer with Stella & Dot, and I have always had strong sales in both July & August. I think part is due to the boost I have gotten from attending Hoopla (more on that later) and part is mixing a bit of business in with my vacation. As I mentioned earlier, I actually spend much of my summer in Maine, so I just do a little planning ahead of time to make sure I keep everything in balance. Part of that means scheduling a trunk show or two on my route here and back. I typically have to head back to MA for a hair or dr appointment once in a while so I plan a couple of shows around those trips as well. This planning means that I can cluster a couple of trunk shows together early in the month and then spend a couple weeks enjoying my summer (with a few hours here and there for customer service and keeping up with our team) before I have another trunk show or two to round out the month. The nice thing is, when I get back to real life at the end of August, I typically have one or two trunk shows already on the books for September, which means I don't feel anxious about coming home to an empty calendar! I have found that by doing 3 trunks shows or so in both July or August - and focusing on quality over quantity - I have strong sales over the summer and meeting people for those Fall trunk shows! All that said, each of you need to do what works best for you! That is why we do what we do! We are each our own bosses, and and run our businesses in a way that fits our individual lives. So take my advice and shape it to fit your life. And remember, wear those jewels by the pool, stick a mini look book in your getaway as you are out and about on your vacations. Sell on the go! And always, if you give a mini, get their information so you can send them a full sized look book and follow up. Let me know if you want to chat one to one.... I am here to help you have the best summer yet and have you hit your business goals too! Dot Dollar Redemption Days = Easy Sales for us!! If you have any clients who shopped with you in June, now is the time for that fabulous customer service and follow up! Contact them individually and make sure that they have their promo codes (you can access a personalized report via the lounge). Remind them off that piece that they had on their wish list from the trunk show. I have already had $400+ in orders from Dot Dollar customers.... easiest $$ I have ever made. There are 4 days left (ends 7/11 at midnight) so reach out and see how close you can get to $500 in sales - and month one of the consistency bonus - just through dot dollars! I have included an email that I am sending to clients! Feel free to use it too! Good luck! Hoopla is a Week Away!! I am so excited to be in Vegas next week with 4 of our teammates!! Holly, Tye Moore, Adrienne, Amy and I are going to see the new line launch in person at the fashion show, get showered with swag, soak in some amazing training from some of the top leaders in the company (including our very own Carrie McGraw), and party the night away Vegas style! I've never been to Vegas, so I am especially excited! When we come back, I will put together some of our top takeaways to share with all of you. We will also share our top picks from the new line to help you as you make your decisions as to what samples to purchase & use those credits on! Enjoy these summer days Ladies! And as always, reach out if you want to chat! That is what I am here for! It paid to shop in the month of June because YOU have $75 Dot Dollars to spend! 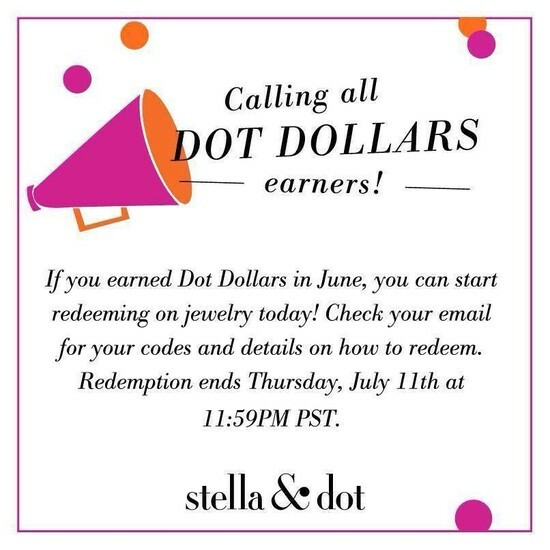 From now until midnight on 7/11, you can redeem your Dot Dollars on your favorite jewels! To use them, you need to spend a minimum of $50 on a jewelry in order to redeem each $25 Dot Dollar promo code. I know that you had your eye on the Amelia Drop Earrings. You can apply $25 to that order and save some $$! If you have any questions, please let me know! In the meantime, here’s a tip: All of our spring/summer collection will work year round! Look how to wear our Jolie and Pegasus this fall with a great print shoe and neutral tops! Use your Dot Dollars from July 3-11. Happy shopping!